Aragorn and Arwen lay sleeping peacefully, entwined in each other’s arms. Life was sweet. The kingdom was secure; their friends were all happy and in good health, while their beloved little son delighted them more each day. A sudden knock on their door disturbed their peaceful slumbers. “My lord, my lady, Prince Eldarion is unwell!” cried the voice of Eldarion’s nurse. The young prince had been moved to his own chambers recently, as his liking for awakening early had left his parents severely deprived of much needed sleep. His nursemaid slept in the same room with him. She had been given strict orders to come to the King and Queen at once, should Eldarion have need of them. Aragorn was out of bed in an instant, pulling a robe over his nightshirt and securing the sash around his waist. He was already opening the door, while Arwen was still collecting her wits. Despite her superior Elven senses, long years as a Ranger had made Aragorn quicker to react. “What is wrong with him? Speak!” Aragorn asked somewhat sharply, opening the door to reveal the anxious nurse, clutching a miserable looking Eldarion. “You acted rightly. My concern for my son caused me to speak sharply to you. I apologise.” The King managed to smile faintly at the woman. She dipped her head. Although she had worked in the King’s Household since Eldarion was born, Aragorn’s humility and good manners never ceased to amaze her. “What ails him, Míriel? Give him to me!” Arwen had joined her husband and reached out to take her child. She cradled him lovingly in her arms. Eldarion promptly vomited all over his mother. “Whatever is wrong with our son?” Arwen's composure faltered as soon as the nursemaid left the chamber. Tears welled up in her eyes. “Let me look at him while you change your nightgown,” Aragorn suggested, taking the child from her. Eldarion was burning hot to the touch. It was all too apparent that the heir to the House of Telcontar had developed a fever. Aragorn examined him carefully, but could find no cause for it. He could only assume it was a spring chill. As soon as the water arrived, Aragorn steeped athelas in it and bathed his young son. The royal couple spent the rest of the night trying to ease their fretful child. Aragorn’s healing skills and Arwen’s loving touch soon soothed the young child a little, but he continued feverish and listless throughout the next day, refusing to eat and crying if his parents left his side. Aragorn cancelled his duties for the day and sent a message to Faramir in Emyn Arnen, asking him to return at once to Minas Tirith. Meanwhile, a distraught Arwen paced the chamber with their son in her arms. “My poor little one, he is shivering now. A moment ago he was so hot!” Arwen fretted. “Give him to me,” said the King. ”I can keep him warm.” He loosened his shirt and tunic and placed his son under them next to his heart, where he held him until he became over hot again. 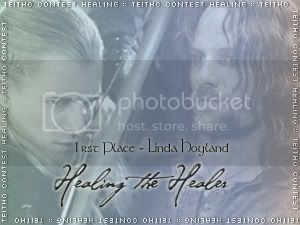 By the next morning the mystery of Eldarion’s illness was solved. Aragorn bathed his little son again and found the small body covered in large red blisters. Arwen looked aghast and burst into tears. Within a few days Eldarion was almost his usual lively self again. The main task of his devoted parents was to keep him from scratching and away from other children until he ceased to be infectious. Life soon returned to normal within the royal household. Three weeks later, Aragorn awoke in the middle of the night feeling too hot. Deciding it was the spring weather, which as a Northerner, he still found difficult to accustom himself to, he threw off the blankets without disturbing Arwen, and went back to sleep. At daybreak, he arose and washed and dressed as usual. His head ached and the room seemed unbearably stuffy. “Are you well, beloved? You have hardly touched your breakfast!” Arwen enquired anxiously. “I am late for the Council Meeting,” Aragorn said abruptly, evading her question. He hurried from the room before she could press the matter further. Aragorn wondered if the Council Chamber had somehow miraculously moved, as the walk seemed especially long that morning. He felt exhausted by the time he arrived. He quickly sank down in his seat after opening the meeting. He struggled to concentrate on a debate whether or not trade tariffs to Harad should be increased. Faramir, sitting beside him, looked on in concern when his lord repeatedly mopped his brow and kept closing his eyes. “Are you well, sire?” he whispered, so softly that only Aragorn could hear. “I am well!” Aragorn bellowed angrily, making the councillors jump. “My lord?” Faramir laid a placating hand on Aragorn’s arm. Much to his alarm he felt the flesh burning hot beneath the fabric of the King’s tunic. “How dare you!” Aragorn demanded as soon as the others had left. Aragorn opened his mouth to argue but found he lacked the strength. He slumped dejectedly in his seat. “Come, mellon nîn, can you walk?” Faramir said gently. “I can if you take my arm,” Aragorn replied, conceding defeat. Even though he leaned heavily on Faramir’s arm, it took the King twice the usual time to walk to the royal apartments. Faramir knew better than to suggest that they summon guards to carry their lord on a litter. “You should see the healer,” Arwen persisted. “I am concerned only with your good, Estel,” Arwen said somewhat sharply. “I know, vanimelda, but there is no cause to trouble Master Aedred,” the King said more gently. He slumped dejectedly on the bed and fumbled to unlace his boots. Tactfully, Faramir assisted him to remove them before helping him to unlace his shirt and tunic. Faramir then helped his lord finish disrobing and change into his nightshirt, knowing that for a proud and fiercely independent man such as the King, asking a servant to help him perform such tasks would be deeply humiliating. Arwen mixed the willow bark tea and held the cup to her husband’s lips. “You are acting like a child, Estel!” scolded the Queen. “He does usually add honey to my medicines,” said Faramir diplomatically. “But you are not the greatest healer in Gondor who understands full well that the most bitter herbs are often the most potent!” Arwen said somewhat sarcastically, giving her husband a commanding look. Grimacing in disgust, Aragorn drained the medicine, then glared at his wife and his Steward. The King groaned, settled back on his pillows and soon fell into an uneasy sleep. As Faramir returned to his own apartments he wondered what it must be like never to suffer the miseries of coughs and colds, sore throats and fevers, many of which had plagued his childhood and still at times laid him low. Sometimes Elves seemed to be very unfairly favoured over humans by the Creator. Yet the thought of living thousands upon thousands of years filled him with horror rather than envy. Life was all the more precious for being finite. The Steward ordered a meal to be brought to his rooms, but had little appetite, worrying how his friend fared. He had never seen Aragorn brought low by anything like this before. As was his custom when staying in the city, Faramir penned his daily missive to Éowyn telling her how much he loved and missed her and their daughter, and what events had transpired during the day. He concluded the letter with a warning that he would be unlikely to be able to return home the next day as he had hoped. Faramir spent most of the afternoon dealing with matters of state, a far greater workload than usual since he had to deal with the King’s duties as well as his own. Consequently, it was early evening before he was able to return to Aragorn’s rooms. The King was still sleeping. Faramir gladly agreed to sit with him, while Arwen spent some time with her son, gave Eldarion his bedtime meal and helped the little boy’s nanny put him to bed, as was her custom. “I have strange dreams too when I feel unwell,” Faramir soothed. He took the damp cloth Arwen had left by the bed and bathed Aragorn’s face and neck with cool water. “How do you feel?” the Steward asked. “Stop fussing like a mother hen!” Aragorn said grumpily, but had the sense to do as he was bidden. An hour or so later, Aragorn was bathed, clad in a clean nightshirt and settled in fresh sheets thanks to the efforts of his wife and his Steward. “I will take my leave now; it grows late,” said Faramir, bowing and kissing Arwen’s hand, then pressing a loving filial kiss on the King’s brow. “Surely you should take the bed, my lady,” Faramir protested. “But you are the Queen and a lady!” Faramir protested. King, Queen, and Steward passed an uncomfortable night made easier only by the fact that Aragorn’s fever appeared to be abating slightly. It seemed that Aragorn was right and he had only caught a chill. “I will eat the same as you, my lady,” said Faramir. “It looks like the chickenpox to me,” said Faramir. Aragorn’s itching grew steadily worse. By the time Aedred arrived, he was writhing around as if the bed were full of fleas. “How may I be of service, my lord? “ Master Aedred enquired. “It took you a long time to come!” Aragorn said grumpily. “I am covered in itching lumps that drive me to distraction, and I have had a fever since yesterday,” Aragorn replied testily. “Why did you not send for me yesterday then?” Aedred asked. “Because my husband knows more about healing than any other man in Gondor, and failed to take my advice!” Arwen said sweetly. “As am I! “ Aragorn retorted. Arwen moved to the bedside and started to unlace her husband’s nightshirt. ”I can do that!” he protested. “I thought it would be easier as your hands are so moist from your fever,” she replied calmly. “I would be alone with Master Aedred!” Aragorn snapped. Shrugging slightly and exchanging a faint smile with the healer, Arwen gestured to Faramir. Together they left the room. Aragorn miserably and reluctantly pulled down his nightshirt, revealing the unsightly patches that disfigured his body. Secretly, he feared that this was some permanent disfigurement. Though he always disrobed in his dressing room, he hated to think of his mortal body being made even more imperfect in comparison to his beautiful, flawless wife. “I am certain there are more now than there were but an hour ago!” Aragorn exclaimed in alarm. “Hmm,” was Aedred’s only reply as he began to examine Aragorn’s skin. “Usually that is only necessary with a child, or the very frail,” the healer replied placidly, pressing his ear to the King’s chest. “Yes, but. I forbid you to see the others! They all look just like these.” Aragorn clutched the sheet determinedly around his waist. “What do you mean, hmm?” Aragorn demanded, a hint of alarm creeping into his voice. Aragorn nodded. ”Now you have told me what ails me, what can you do to cure me?” he demanded. “Treat yourself as you treated you son. There is absolutely nothing I, nor even a healer such as yourself, can do about chickenpox, as I thought you well knew! I will call your lady back so she can hear my advice.” He went to the door and called to Arwen. “Have you no potion or salve to cure me?” Aragorn pleaded. “Is there any point, since you say you can do nothing?” Aragorn said tartly. Aedred merely gave a polite bow and left the room. Exhausted from the encounter, Aragorn slumped back against his pillows despondently. Arwen plumped up the pillows and smiled. ”Well, that is good news, my love!” she said. “It is not a warrior’s condition!” Aragorn said crossly. “Must you leave, vanimelda?” Aragorn pleaded. “Our son has need of me too,” Arwen replied firmly. Faramir hurried back into the chamber. “Does Master Aedred know what ails you?” he asked anxiously, his features tense and drawn. “He has caught chickenpox from Eldarion,” said Arwen on her way out of the doorway. “Praise the Valar it is nothing worse!” Faramir’s features relaxed. Aragorn’s flush was barely noticeable under the cover of his fever and the increasingly all-pervading rash. “I cannot spend weeks playing in the garden!” Aragorn replied testily. “I want someone to keep me company and talk to me,” Aragorn said mournfully. “My head aches,” said the King without enthusiasm. “The History of the Stewards of Gondor?” Faramir was becoming desperate. “Now that would send me to sleep,” Aragorn said dryly. “It sounds perfect then!” Faramir picked up the book and began to read, hoping that Aragorn would soon fall into a doze. Instead, the King gave a running commentary on the deeds of the Steward’s forefathers. According to Aragorn, Mardil should never have allowed Eärnur to go and challenge the Witch-king; Cirion should not have ceded territory to Rohan permanently, while Pelendur should have awarded the crown to Arvedui; in which case Aragorn would have been able to wed Arwen in his twentieth year. “I have indeed, my lady,” said Faramir, grateful for the respite. His diplomatic skills were being stretched to their limits. “I will, you have my word.” Faramir made good his escape before the King could command him to stay. He was hungry; his throat felt like parchment, and his own head was beginning to ache. Much to the relief of both Queen and Steward, Aragorn slept for most of the remainder of the day, waking only to take water and tea made of medicinal herbs. Now that Aragorn was able to get out of bed unaided, Faramir was able to retire to his own rooms for the night, but overwork and concern for the King made his sleep fitful and much troubled by dreams. The next morning when Faramir returned to his friend and lord’s rooms feeling barely refreshed, he found the Queen was laying out the chessmen on the board in the bedroom. Aragorn's gaze brightened when he beheld Faramir. “Oh, there you are, Faramir; you have been gone a long time!” he said. “I was just suggesting that a game of chess might amuse Estel,” Arwen explained. “Very well,” Faramir conceded without a great deal of enthusiasm. The Steward took his place at the chessboard opposite the Queen somewhat apprehensively. He was a good player, and a fairly even opponent to the King, but the idea of playing someone of Arwen’s age and experience was a trifle daunting. He was not a vain man, but hoped he could at least entertain his lord and not look foolish. The two sat facing each other, Faramir having drawn lots to start. “Hurry up,” said Aragorn, scratching at a blister on his face. “Stop scratching, Estel!” Arwen chided. Faramir began rather nervously and quickly lost two pawns. Faramir did as he was bidden and waited for Arwen to make her move. “No, use a pawn and protect the king, “Aragorn told his wife. Humouring him, she followed his instructions and promptly lost the piece to the Steward. Faramir, eager to press his advantage, was about to bring his queen into play when Aragorn interrupted. “No, play the knight instead!” he instructed. Faramir did so and was immediately captured by Arwen’s queen. Now, much more alert, Aragorn was sitting up in bed watching the game intently. “Am I playing this game or are you?” The usually placid Queen finally let her annoyance show. Faramir took a deep breath. “Why do you not play instead? You seem a little better now," the Steward suggested desperately. "We can move the game on to the bed. Alas, I have just remembered that I have a meeting with some trade representatives from Dale." "Cannot one of your secretaries negotiate the deal in your stead with them?" Aragorn looked far from happy. "I fear not, capable though my staff are," said Faramir, ignoring a pleading look from the Queen. "If neither King nor Steward attend the meeting, rumours will spread that you must be seriously ill."
"Very well then, but return soon," Aragorn conceded. As soon as he left the sickroom, Faramir took a deep breath and clenched and unclenched his fists. Patience was a habit both inborn and schooled; he was a patient and mild mannered man, but he had felt like hurling the chessboard across the room. Aragorn was a wonderful healer, but a truly dreadful patient. Truth to tell, the meeting was not due to start for another two hours, but it had served as an excuse to escape the sickroom. He returned to his chambers and busied himself with the neglected paperwork of the past days. Never before had a meeting seemed so enjoyable to the Steward. The sometimes heated negotiations over tariffs on imported crockery seemed blissfully peaceful after trying to entertain the ailing King. He only concluded the meeting after three hours had passed, and the visitors were starting to stifle their yawns. Feeling like a schoolboy playing truant, Faramir took a short walk in the gardens before returning to the King's apartments. Arwen came out of the bedroom to meet him, her finger raised to her lips. "The Valar be praised! Estel is sleeping," she said, leading the Steward into the sitting room. "Would you sit with Estel, while I spend some time with Eldarion? I should like to get some fresh air with him before giving him his lunch." "Of course, my lady," said Faramir, wondering when he would be able to eat his own meal. If he ordered it to be sent to the bedroom, Aragorn would most likely complain that sight of food made him nauseous. Arwen sighed. "I shall be very glad when Estel is back on his feet," she said. "I fear grown men differ very little from small boys when they are unwell!" "That is true, my lady," said Faramir. "Tell me, though, do Elves fare any better?" Arwen laughed. "If anything, they are worse, but unlike Men, they do not succumb to infectious illnesses. I recall when Glorfindel was confined to bed with a severe wound my father was driven to distraction!" Faramir went into the bedroom and settled on a chair. The King lay in the centre of the vast bed, snoring loudly. The Steward felt his own eyelids growing heavy after his disturbed night. Faramir shook himself. It would not do to fall asleep. There was a small writing desk in the corner with quill and ink. The Steward decided he might as well prepare some notes concerning the next Council meeting. Taking up the pen, he started to write and was soon engrossed in his task. "You woke me up! The scratching of the pen is making my head ache!" Aragorn said accusingly, raising his head from the pillow. "I am sorry, but I do have a kingdom to run in your name while you are unwell!" Faramir retorted, unable to conceal the irritation in his voice. "I will go elsewhere if you prefer!" "Go then!" Aragorn said crossly. "Maybe I can get some rest without either you or my wife hovering!" Deeply hurt, Faramir gathered up the papers and left the room. Mindful though of his promise to the Queen, he went no further than the sitting room. He tried to resume his work, but could not concentrate. When Arwen returned, he would tell her to ask one of the healers to assist her in looking after her husband. He would leave the ungrateful Aragorn to his own devices. The Steward was tempted to ignore the call from the next room. Aragorn had everything he needed at hand and could get out of bed if necessary. "Faramir! Are you there, mellon nîn? Do not leave me!" Aragorn's voice was pleading. Faramir wavered. A loud crash, followed by a cry, came from the bedroom. Faramir immediately ran back inside. At the doorway, his eyes swept the room, noting a glass lay shattered on the floor. "I am sorry, mellon nîn. The glass fell when I reached for it. I seem to be causing a good deal of trouble," Aragorn said miserably. His face was now almost completely covered with livid red spots, and he looked on the verge of tears. Faramir felt a sudden surge of compassion for him. It could not be easy for a man like Aragorn Elessar, who had spent most of his life fighting the forces of the Dark Lord to be brought low by a common condition most usually suffered by small children! Nor could it be pleasant for a great healer to be unable to heal himself. Faramir then recalled the times he had been ill and Aragorn had patiently cared for him. He had not been the easiest of invalids to deal with either. Faramir inwardly chided himself for judging a sick man too harshly. "It is nothing, just a broken glass," said Faramir, making to pick up the pieces. "I am sorry too for what I said earlier," said Aragorn. "I did not mean my harsh words. I am truly blessed that you and Arwen are willing to stay by my side. It is just so frustrating to be confined thus to bed!" "I know," said Faramir understandingly, placing a comforting arm around Aragorn's shoulders. "This will pass soon. I should not have lost my temper either. Let me get you some more water. Do you wish for anything to eat?" "I am not hungry, though I suppose I should try to eat. I would imagine you must be ravenous, given the lateness of the hour," Aragorn replied, squeezing Faramir's hand gratefully with his own spot-covered one. When the Queen returned she found Faramir devouring a large plate of stew, while Aragorn sipped a mug of tea, and nibbled at a poached egg on toast. If the Queen were surprised at Aragorn's sudden improvement in temper, she did not say. The days passed slowly, but with each sunrise Aragorn's spots faded and his strength slowly returned. Arwen stayed beside her husband, often with Eldarion, when the little boy could be persuaded to play quietly with his toys. Every moment that he could be spared from his duties, Faramir spent with his lord, telling him how the day's business had gone and asking his opinions. At last the day arrived when Aragorn's blisters had all healed over. "You are no longer infectious, sire," pronounced Master Aedred, knowing full well he was not telling the King anything Aragorn did not already know. “You may resume your duties so long as you do not overtax yourself." "I may have had chickenpox, but I was still King of Gondor these past days,” said Aragorn dryly. "Thank you, Master Aedred. I hope we shall not meet again under these circumstances! I prefer to work beside you."